Every roleplaying game has a section at the beginning that attempts to explain what a roleplaying game is, and Bulletproof Blues is no exception. This is the section that the second edition of Bulletproof Blues (coming soon!) will have in the Introduction chapter, explaining what a roleplaying game is. As trivial as it sounds, two distinct elements set “roleplaying games” apart from other things which are not roleplaying games: roleplaying and game play. First, a roleplaying game involves roleplaying. Generally speaking, roleplaying involves taking on a persona or character and making decisions based on what that character would do in a given situation. Does having a character in a game, by itself, make that a roleplaying game? No. The little dog token in a Monopoly game and a Blood Elf in World Of Warcraft are both characters, but Monopoly and World Of Warcraft are not roleplaying games. Can you roleplay as a dog while playing Monopoly? Yes, and you can roleplay as an elf while playing World Of Warcraft. 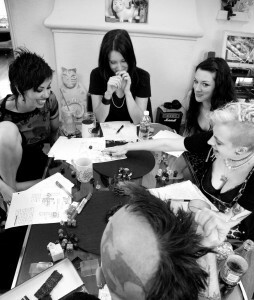 What keeps these from being roleplaying games is that the roleplaying is not part of the game — you can’t get your Monopoly dog out of jail through unscripted conversation with the jailer, nor can you use roleplaying to convince a cultist in World Of Warcraft to let you pass by without a fight. If the rules of the game do not allow for the possibility that a conflict could be resolved through unscripted conversation (however unlikely that might be), then it isn’t a roleplaying game. Second, a roleplaying game is a game. Roleplaying games are sometimes compared to improvisational theatre, and there are similarities, but improv theatre isn’t a game. How can you tell if something is a game? Games have rules that govern things like conflicts between players and whether something a player attempts is successful. Improv theatre is fun, but there aren’t any rules like this. As Drew Carey described “Whose Line Is It Anyway?”, it’s “the show where everything’s made up and the points don’t matter.” It’s fun, but it’s not a game, and therefore it’s not a roleplaying game. Bulletproof Blues has more rules than some games, but less than others, and an essential part of conflict resolution involves making decisions that your character would make under the circumstances. Maybe those decisions aren’t the most tactically advantageous, but if they are true to what your character would do, and if you are having fun playing, then you are playing correctly, because that’s what Bulletproof Blues is all about. If you would like to read more about who plays roleplaying games, and why and where they play them, check out www.theescapist.info.